The Grand Mosque (Mesjid Raya) Batam Centre is located at Batam Government Center, adjacent to the Batam mayor’s Office, Councils building, International Ferry Terminal Batam Center and Mega Mall shopping center, precisely located at Jl. Engku Putri. This Mosques has a beautiful 'pyramid' architecture. Quite good but already looks a bit old. Mesjid Raya Batam Center is the biggest mosque in Batam. The location is very strategic you can reach it within 3 minutes from the International Port of Batam Center, 20 minutes from International Airport Hang Nadim and 20 minutes from Nagoya which is the business center in Batam. In the region of Mesjid Raya Batam Center is also as boarding pilgrims and several conference hall, the area is very large. This mosque has unique characteristic where inside the mosque there is no pole so it looks very spacious. And also it has twin tower. 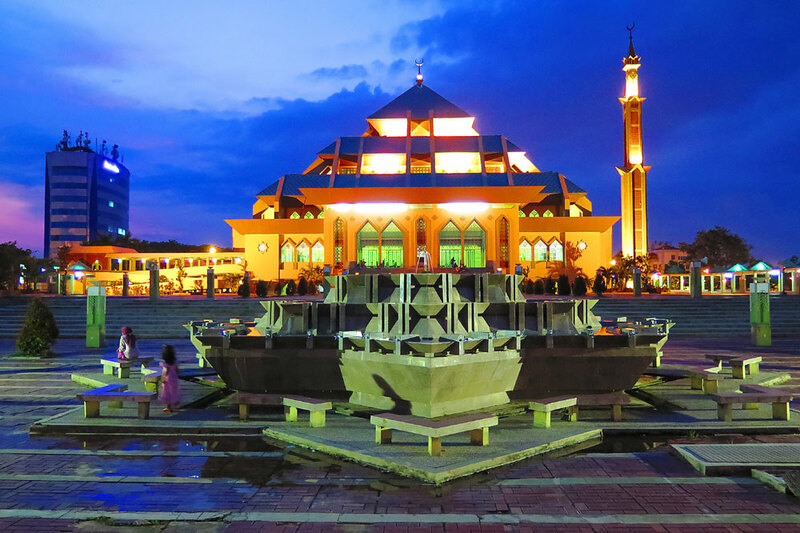 With the Middle Eastern-style architecture with decorated by beautiful ornaments it makes the Mesjid Raya Batam Center looks more beautiful, especially at the night with headlights that make more majestic. This mosque was designed by same architect with one of mosque in Sulawesi that’s why it looks similar with one of the mosque in Sulawesi.